WHAT YOU'LL GET - Our premium weighted blanket provides 10 pounds of comfort and measures 40" by 60". Blanket cover not included. COMFORTING WEIGHT & PRESSURE- Studies suggest that weighted blankets provide soothing comfort for those dealing with stress, anxiety or sensory disorders. Mimicking the feeling of being hugged or held, weighted blankets are used to relax the body and provide excellent sleep. PERFECT FIT - Our 10lb weighted blanket is recommended for youths, smaller body types and those looking for light pressure. THOUGHTFUL CONSTRUCTION - Our weighted blanket is made with breathable 100% cotton. A filling of sand-like beads helps maintain a perfect temperature while adding just the right amount of weight. Carefully constructed squares keep the weight distributed throughout the blanket for a more even pressure. Corner loops provide a no-fuss attachment for our weighted blanket cover. CARE INSTRUCTIONS - For easy care options, pick up our matching machine-washable weighted blanket cover. Covers are sold separately. 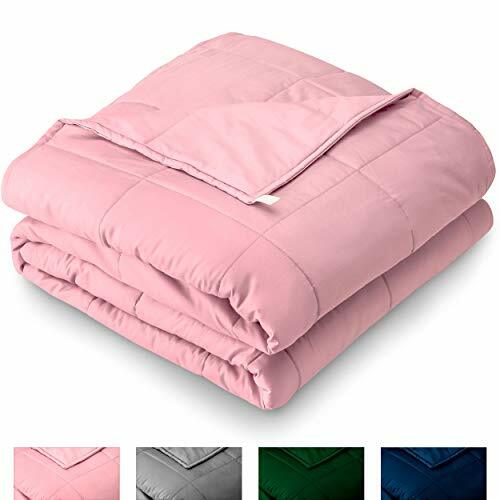 Our weighted blanket can be washed on gentle settings, hand washed or dry cleaned. Machine dryers are not recommended.